Children are flowers in the garden of the world…they blossom and spread happiness; and Isha strives to nourish these flowers by providing robust child healthcare for newborns, infants & all children up to 18 years including adolescents. Isha Multispeciality Hospital’s Department of Paediatrics specializes in providing developmental paediatrics and supportive care for special children. This is the only private setup providing such facility in the state .Very low birth weight newborns when discharged from NICU are watched carefully for delay in development. Genetic disorders will be expertly managed with diagnosis and genetic study. The department has a dedicated Paediatric ICU and Neonatal ICU to provide special care to critically ill children and newborns. A unique feature is the establishment of the comprehensive paediatric programmes includes Paediatric Surgery, Cardiology, Neurology, Orthopaedics, Nephrology, Endocrinology, Haematology, Onco-haematology & adolescent medicine. Developmental pediatrics with a well equipped centre for ‘special children’, Counseling & support for Genetic disorders. 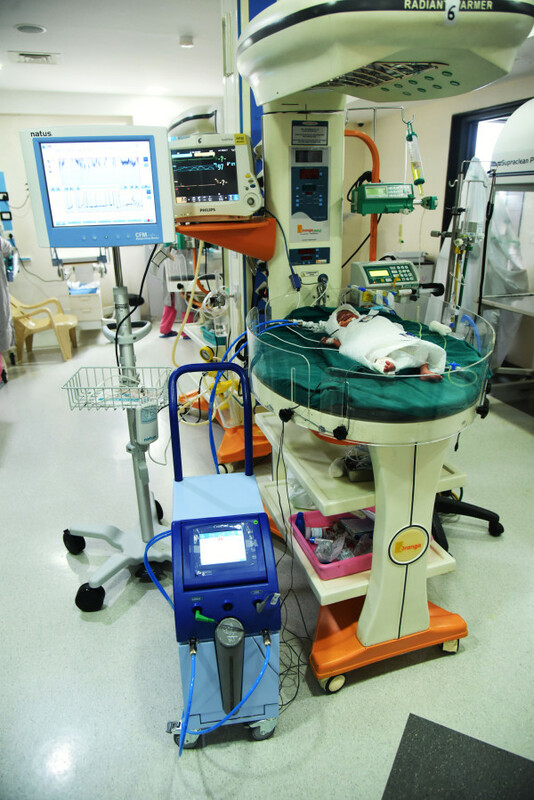 These are sophisticated machines that provide artificial breathing to babies. The doctor can adjust the rate, the volume, the pressure of the breath, the percentage of oxygen in the breath and many more important parameters. These machines are life saving in cases of respiratory problems where extra effort and oxygen is required. Hospital has paediatric critical care specialist with skills, knowledge and experience for required close monitoring in critically ill paediatric patient.PICU’s experienced staff is present round the clock. A Capnograph measures how much carbon dioxide is present in the patient’s breath. They are an essential piece of monitoring and you can find them in areas such as operating rooms, recovery, critical care, wards, and ambulances. Oxygen is necessary for life. Oxygen goes through a series of steps before it reaches the cells. The cells use the oxygen and produce carbon dioxide (CO2) as a waste product. The CO2 , like the oxygen, goes through a series of steps before it is expelled out of the body. The capnograph is able to measure the expelled CO2. This is an extremely useful measurement as it can help detect problems along the pathway taken by the CO2. For an example, if the patient stops breathing (e.g. due to morphine), CO2 will not be able to “get out”. This problem will make the capnograph show a low CO2 reading and trigger an alarm that alerts medical staff to the problem. Maintaining the body temperature within a normal range is essential for good outcome of sick babies, especially premature and babies having low birth weight. The infant radiant warmer continuously checks and monitors the baby’s skin temperature and accordingly the heating intensity is automatically adjusted by the computer. These are wonderful devices that estimate the percentage saturation of oxygen in the circulating blood. They also indicate the heart rate and give an indirect indication of the flow of blood. These are machines that deliver fluids and medicines at a very measured rate continuously, round the clock. These pumps are essential when dealing with small babies where the fluids and drugs have to be measured accurately. Essential for newborn babies having jaundice. This machine emits high intensity of light at a particular wave length which corrects the Bilirubin (the yellow Pigment) into another isomer which is soluble in the body and is washed out in urine and stool and thus reduces the jaundice. We have single and double surface LED phototherapy units. This specialized surgery dealing with newborns and children having congenital malformations and other surgical problems.With NICU & PICU setup, Isha Multispeciality Hospital offers various such surgeries. The surgery is carried out by paediatric & neonatal surgeon and paediatric anaesthetist in most modern and well-equipped operation theatre. Post-operative care is in NICU and PICU. This machine is useful when the baby has a good respiratory effort but needs an extra push to maintain the oxygen levels in the body within the normal range. Even the’ not so critical babies require vigilant monitoring and so do the babies discharged from NICU before being sent home. For this purpose, we have specially designed rooms with radiant warmers. 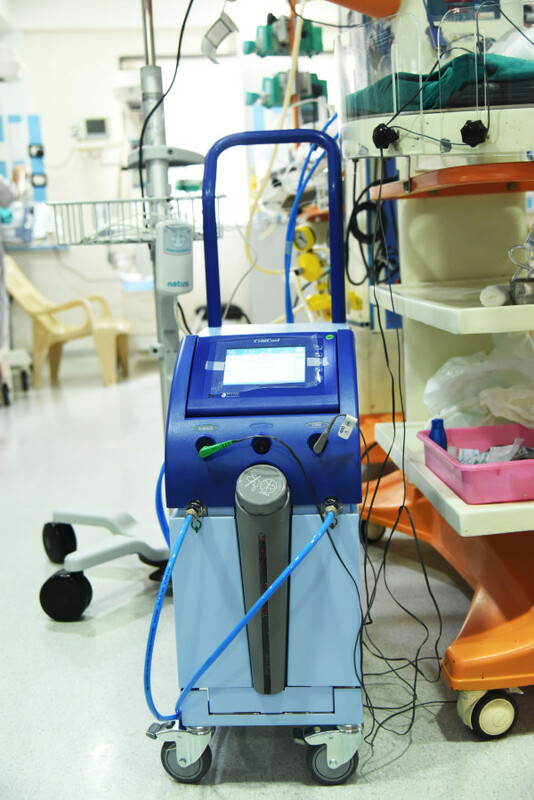 Central oxygen system provides ample oxygen continuously as required in the ICU at pressure desired. Highly trained staff of NICU – PICU and are capable of dealing with all sorts of emergencies. Newborns are not just small adults but pose special challenges, in case of medical problems. Premature babies who are born before full term and babies with poor birth weight have special problems and needs which need to be tackled with expert care and good infrastructure facilities in the nursery. Their lungs are premature and may need artificial ventilation to support breathing. Their brains are premature and may need developmentally supportive care so that in the future they achieve maximum potentials in growth and development just like their peers. Neonatology is the speciality to evaluate and treat medical problems, with specially designed equipment and the best possible medical care in the well-equipped NICU. Isha Multispeciality Hospital has 20 high tech incubators in NICU, the biggest NICU in the state all with critical care and ventilator support. Good developmentally supportive newborn care in the nursery & good neuro-developmental follow up for 2 years at the development centre. The Neonatal Intensive Care Unit (NICU) at Isha Hospital is a 20 warmer regional referral centre for neonatal intensive care. Trained neonatologists are available in NICU who are capable of dealing with all emergencies. The NICU unit is equipped with radiant warmer units, Phototherapy units, Separate cubicles for infected babies with separate air flow, Ventilators, Capnography, Pulse Oxymeters, CPAP Machines, Central Oxygen Lines, Central suction lines, an Ultrasonography Machine, Central Monitoring Systems, Laminar flow system for neonatal care. All of this is very importantly backed up with generator support, in case of electricity failure. There is a room for the mothers to begin feeding as soon as baby is stable and additional rooms for the mothers whose babies are admitted to the ICU. There is also a stepdown ICU for the less-critical infants and for the babies to be shifted out of NICU once they are stable. We have a M.S.W who looks into the economic and social matters of patients and due considerations are given to needy patients. Continuous upgradation is Isha hospital’s core principle. We have been upgrading all our equipments to latest and best technology evolved in recent years. As part of this process we have acquired two most advanced equipments for the NICU. Used for THERAPEUTIC HYPOTHERMIA & REAL TIME EEG in the NICU. Results in significant reduction in death and neurodisability following hypoxic ischemic encephalopathy at birth. Therapeutic hypothermia has been used for NEUROPROTECTION in NEONATAL ENCEPHALOPATHY following a PERINATAL HYPOXIC event. A controlled reduction of core body temperature to 33-34* C, initiated within 6hrs of birth and continued for 72hrs, followed by slow rewarming, results in a significant reduction in death and neurodisability following hypoxic ischemic encephalopathy . The Olympic brainz monitor is the optimal CFM solution for fast & simple routine bedside monitoring which provides aEEG, real time EEG. NICU friendly and allows real time monitoring of brain function providing vital data that may assist in predicting outcomes. Isha Multispeciality Hospital has the only PICU of the town. Paediatric emergencies are referred essentially to Isha Hospital. The Paediatric Intensive Care Unit (PICU) at Isha Multispeciality Hospital is a 7-bed, regional referral centre for paediatric intensive care. The unit is staffed by paediatric intensivists and dedicated nurses. The PICU staffs are especially sensitive to the needs of both children and parents. To help ease the stress that illness and medical emergencies cause the families, the unit provides facilities for one parent to remain with their child throughout the stay. The PICU at Isha is a highly-specialized intensive care for children of all ages, suffering from acute life-threatening illnesses. The PICU team works closely with the entire range of children’s paediatric sub-speciality services. Paediatric patients post-surgery and those with head trauma will be looked after by Paediatric Surgeon, Neuro Surgeon and the entire PICU team. There are isolation beds for patients with Immunodeficiency, Cancer etc. Most children fortunately are born without any medical problems or birth defects. But there are some who are born with a difference in their body structure, brain development or body chemistry that can lead to problems of their health and overall development of body/brain. Paediatric genetic disorders are identified by specialists & counselling and support is given to the families to in case of any hereditary (coming from the genes) health conditions. Testing is offered to family members who may be at risk of having children with such disorders in the future. With the help of an extensive lab work, complex genetic and metabolic disorders are worked up and proper advice on future management, cause of disease and prognosis is offered to the family. Paediatric Surgery includes surgery of newborns, infants, children, & adolescents. Paediatric Cardiology comprises of the diagnosis and treatment of diseases affecting the heart and blood vessels in children. Paediatric Endocrinology is a medical sub-speciality dealing with variations of physical growth and sexual development in childhood, as well as diabetes, thyroid disorders and other disorders of the endocrine glands. Paediatric Haematology and Oncology comprises of diagnostic services and specialist care for children under 18 years of age with cancer (paediatric oncology) and blood disorders. Deals with eye problems related to neonatal care and paediatric eye problems. Congenital orthopaedic problems are treated by paediatric orthopaedic surgeon. A group of physiotherapist and occupational therapist under guidance of Paediatric developmental specialist take care of disabled children. Counselling and guidance on development milestones and early stimulation programs for the high risk new borns are offered. A comprehensive evaluation of the development of a child with necessary interventions and diagnosis treatment of children with developmental delay, cerebral palsy, mental retardation, autism, neuromuscular problems is offered by the department. Each child who comes into OPD is offered a developmental assessment. Any delay / deviation is further assessed with detailed tests. DASII (development quotient), IQ and tests for ADHD, LD & Autism are offered. Counselling and guidance is offered to the parents. Children with Cerebral Palsy, Global Developmental Delay, Mental Retardation, Autism, Neuromuscular problems are managed holistically with Physiotherapy, Occupational therapy, Speech & Language therapy, Sensory Integration and Play Therapy. We offer early (preschool) educational facilities for these children. 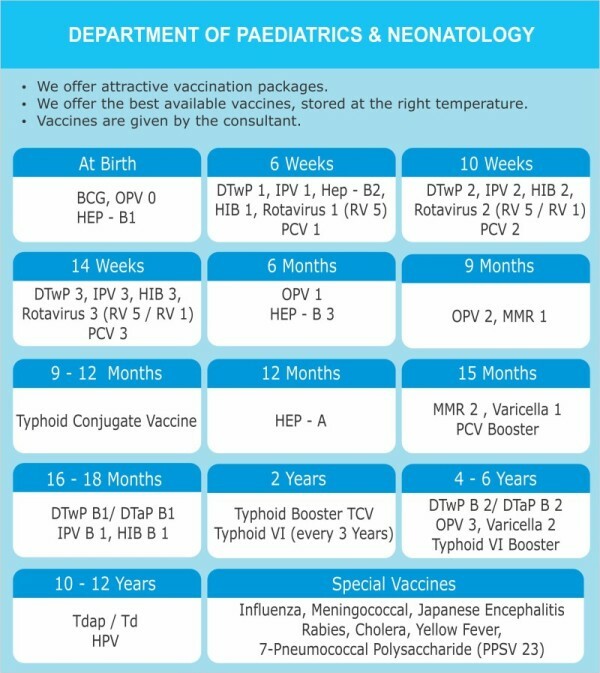 All high risk newborns (NICU graduates) are offered early and comprehensive evaluation along with the necessary patient specific early intervention programs. a. Screening by OAE (Otoacoustic Emissions). b. Diagnostic by BERA (Brain Stem Evoked Response Audiometry) is offered to children and newborns suspected to have deafness.